HomeIt’s Halloween; time to take out the theremin! It’s Halloween; time to take out the theremin! Well, it’s Halloween week, which is when I take out my Etherwave theremin to show to all my students. Dusted off, it’s ready for the kids (and adults!) to play this week in lessons. Sure wish I could play it; it’s pretty hard. But it is great fun to play around with for kids of all ages, and piano and theremin go very well together for spooky-music improv duets! And listen below to the greatest thereminist of all time, Clara Rockmore, who was a master of the instrument. 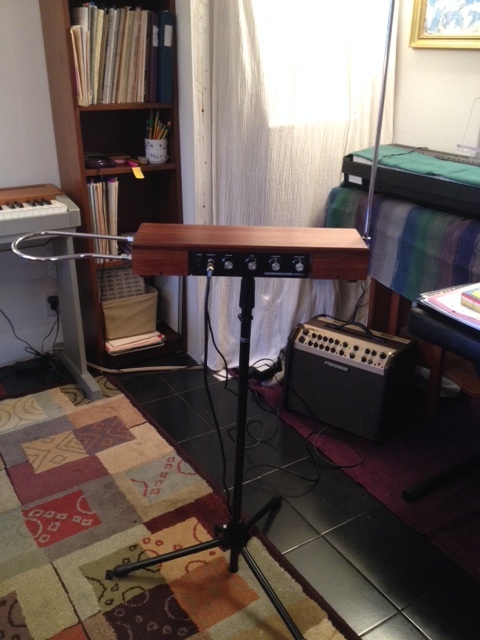 Etherwave theremin set up and ready to play! Below is Clara Rockmore, the greatest thereminist who ever lived, playing at a house concert, not sure of year, Bob Moog is there. All the songs she plays at this concert (with her sister on piano) are beautiful (they’re all on YouTube), but this is one of my favs; her artistry is astonishing. A great documentary on Léon Theremin and his instrument is Theremin: An Electronic Odyssey; you can get it on Netflix.